I have to agree that the unclaimed areas are more favourable for Black. It seems that White has lost. At this moment Black has captured three stones and White has (supposedly) 5.5 komi. As I have heard the idea is to count safe territory, supposing that yose will divide all remaning points equally. But it is Black's turn. dnerra: I think the idea 'only count safe territory' is very useful for early score estimates. They help you decide your strategy. I.e., if your opponent has more secure territory, you maybe shouldn't continue playing for influence (unless you have the chance to create a good framework). Etc. I think at this stage, however, the only way to make a good count is to look at every local situation, look at the outcome when either side plays first, and then take the average of that (now I am neglecting sente/gote issues, of course). As an example, take the lower left. The monkey jump is gote here. If White gets it, the territory will look like you marked it (plus white territory at y, I suppose). If Black plays first, all the x-marked points become his territory. So I would count two more points for Black there than you do. Of course, it is hard to do this quickly in a real tournament game. But: these small mistakes really add up - I think it is easy to be ten points off. My count: Black 47 - White 45,5.
makes 10 points, some of which can still be made if White takes the point . makes 14 (plus it rescues a white stone), some of which can be made in sente if Black takes . makes one point, makes none. So, if we consider the / exchange, Black is slightly ahead and takes sente. 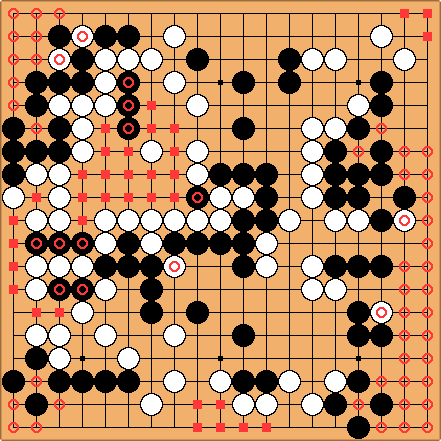 Also, although it is true that in secure territory the game is close, Black has much more yose. White cannot hope to make all three monkey jumps. Bill Spight: Maybe White a is better than . Also, the exchange of stones in the top right is not an even exchange. If, as is usually the case, it leaves the local count the same, we need to give White 2-3 points for the possibility of capturing the black stone. A couple of times you (Dieter) have said that Black has more yose. What do you mean by that? Thanks. The lower left corner is interesting. It may be a place where the small monkey jump is better than the big monkey jump. The small monkey jump has a sente follow-up. If Black replies the count is 8. So the small monkey jump is a 3 point sente. The large monkey jump is approximately a 2 1/2 point gote, since Black gets 6 points or so after White plays it. So it looks like the small monkey jump is sente, and therefore we should count the corner as 8 points for Black. Hmmm. If Black omits , White has a three-point sente play. So the small monkey jump is actually an ambiguous move. Of course, that does not matter for estimating territory. dnerra: It seems that it is better for Black to play tenuki after the / exchange, rather than immediately as in the first diagram. Bill: Actually, is a one-point sente. I did not realize that at first. <sigh> So the small monkey jump is a three-point sente, after all. dnerra: Hehe, too late Bill, now you have to correct my analysis instead. If White plays next, the result is four points (White a, Black b, White c). So after Black's play at a in Diagram (b), the result is at least 6.25 points, hence the result in Diagram (b) is at least 5.125 points. Bill: My first mistake was to think that the large monkey jump threatened to kill Black in the corner. Not so. is a sacrifice for shortage of liberties, so that White cannot connect at and make a real ko. Instead, White has but a threat to kill. Note that this assumes White's stones on the right are secure, which may not turn out to be the case. But that's good enough for an estimate. seals off the corner. Later - is sente. The points a and b mark out the average frontier. Black has 11 points. So if the large monkey jump is orthodox play, the original count is 7.5 and the large monkey jump is worth 3.5 points (miai). The small monkey jump allows Black to reply to a position worth 8 points, losing on average 1/2 point. The large monkey jump is normally better. So our estimate of the corner is 7.5 points for Black.